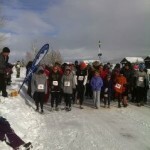 The 2011 Teton Turkey Chase was held on Saturday, Novemeber 19th, and although it was quite breezy and cold, the number of participants was still up nicely from last year. All together more than 120 runners ran in the 10K, 5K or 1 Mile Fun Run. The 10K race was won by Matthew Chorney from Jackson with a time of 36:46:00. Liz Onufer won the women’s division in 51:25:00. Caleb Moosman of Driggs won the 5K with a time of 18:57. Melissa Davidson of Victor finished in 24:59 to win the women’s division. Aidan Walters of Driggs and Rylee Raz of Victor won the 1 Mile Fun Run Fun with times of 6:55 and 7:15 respectively. This year we had 36 runners from the Rundezvous Program from the Rendezvous Upper Elementary School. This is a wonderful initiative to encourage our young people to get out and be active. Most of the runners stayed around for snacks and to visit well after the finish of their event, and it was clear the everyone was having a great time. There are still a few race day shirts available for sale at the Dreamchasers store for just $10. Stop by and pick one up while they last.